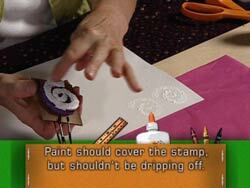 Learn the secrets to creating beautiful pieces of art using everyday materials from around the house. 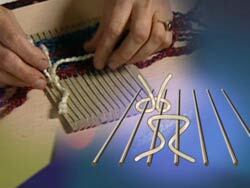 Cherie Lynn shows you how to turn common items like buttons, string, and cardboard into precious works of art. Create your own brand of wrapping paper, mosaic stepping stones for your garden, African rain sticks, paper mache sculptures, clay vases and lots more! Create a mesmerizing piece that changes its look depending on where you are standing when you view it! Make sure you check out the entire Cherie Lynn Art Series! Art on a Shoestring will teach you how to make all of these projects! 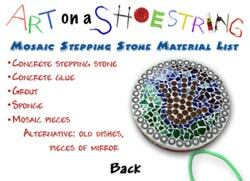 Just like all of the DVDs in the Cherie Lynn Art Series, Art on a Shoestring contains printable instructions and supply lists. Simply insert the DVD into your computer to print them out. You can also view these lists on the DVD themselves (pictured at left). Cherie Lynn, your experienced host and twenty-year K-8 art educator, provides you with easy-to-follow, step-by-step instruction. 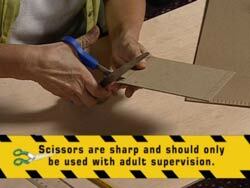 This is accompanied by helpful graphical explanations and tips as well as safety reminders for your little ones.